Item shown above : Solid wood in Oak Finish with a glossy protective lacquer coating (Pins/Medals not included). 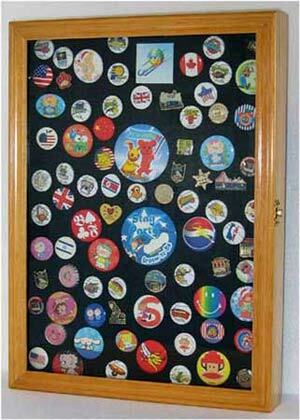 This solid wood pin display case would be a great way to display your collection of pins, ribbons, medals, buttons, brooches, patches and other treasures. Black matted background to create a lovely display. Pins can be placed directly into the foam back. Brass hinges, door latches, and wall brackets to hang (wall mounted). Glass door to protect from dust and damage. For more interior space for the similar display case (without the foam) please see item # PC01B. Interior Dimension: 18"H X 13"W, space between foam and glass is 0.5".